If, like most of us, coffee is part of your daily routine, you may not have even considered the pros and cons of using paper filters versus metal filters to make your favourite cuppa joe. While we support all kinds of coffee consumption, there are certain proven benefits of using pour-over drip bags rather than a French Press (or plunger). We hope you enjoy these little known facts about the benefits of coffee drip bags, and be sure to get in touch for questions, or additional information about online or wholesale coffee orders. Because metal filters aren’t nearly as fine as paper, they often don’t capture everything poured into them. From tiny granules of coffee – called micro-fines – to unwanted oils, using a French Press often gives your coffee a cloudy, murkier appearance than its paper counterpart. A stimulator of LDL cholesterol levels, cafestol often seeps through metal filters and into your cup of coffee. While caffeine in and of itself is beneficial to the heart, long term use of metal filters creates an added risk of cardiovascular pathologies, especially when the coffee is decaffeinated. In paper filters, such as our coffee drip bags, cafestol is almost entirely absorbed by the paper. In essence, paper filters = better heart health. Because oils oxidise easily through metal filters, the taste of your coffee will also change significantly, even over the relatively short amount of time it takes you to consume it. Alternately, paper filters capture these small sediments and oils, and in doing so, create a brighter cup of coffee both in terms of appearance and taste. Paper filters are known to create a sweeter, fruitier, and all-around ‘cleaner’ cup of coffee. If you’ve never experienced the struggle of taking out the rubbish only to have the bag break and spill a mountain of old coffee grinds everywhere, are you even really a coffee drinker? While seasoned French Press users often opt to dump their grinds down the drain, its not unheard of for it to aid in drain cloggage. With our convenient coffee drippie bags, it’s use it and lose it, making clean-up a piece of cake. While yes, you could argue that single use paper filters aren’t as beneficial to the environment as reusable metal filters, we’re proud to say that our drippie bags are biodegradable! After drinking, throw them straight into the compost pile, or top it off with some soil and watch your little seedlings grow. And because our drip bags are designed to be compact and easy to carry around, they are ultimately more convenient than packing a plunger on your next camping trip or even morning beach walk. All you need is hot water and your favourite coffee mug, and you’re set. Big thank you to everyone for reading our blog about the benefits of paper versus metal coffee filters, and we hope you learned something interesting! Be sure to follow us on Facebook and Instagram for the latest announcements and happenings on the Gold Coast, and sign up for our email list for exclusive specials. Whether you’re a long time cafe owner, hotel F&B manager, restaurant manager or even a small or large business owner, we realise the importance of finding the right wholesale coffee supplier for your Gold Coast business. We know how many important decisions you’re required to make on a daily basis, and we’re here to make one of the most important decisions of your morning routine (and business!) a little less stressful. While some companies automatically choose the wholesale coffee supplier with the lowest price, we’ve come to realise the many missed opportunities in this tactic. Below we offer some factors to consider when choosing your next local wholesale coffee supplier, with special consideration of Australia’s booming coffee and cafe culture! When choosing a wholesale coffee supplier, it’s important to ensure you find the perfect beans for your business. While saving a couple dollars may seem appealing, you’re missing out on opportunities for growth by settling for lower quality beans. New menu opportunities – cocktails, desserts, milkshakes, etc. Employee appreciation – Ask your barista or bartender whether they prefer working with (and consuming) quality beans! If you’re going through the effort to ensure your business is serving quality food, why not provide the same quality for your coffee beans? Why Choose The Laughing Pug? Our speciality is guiding business owners, managers and employees on how to make the perfect brew. With two types of superior, delicious whole beans to choose from, both Premium Smallholder Coffees from Papua New Guinea – including our Organic Fair Trade and PNG Gold varieties – we ensure the finest, low acidic, smooth, specialty coffee on the Gold Coast. Packed full of mesmerising, delicious chocolatey undertones and a sweet finish, The Laughing Pug Coffee is the perfect choice for espresso, drip coffee, cold brew and the ever-popular Aussie cocktail of choice, the espresso martini (aka “Pugtini”)! We value each and every one of our local wholesale customers, and are here to guarantee you’re serving the perfect brew each and every time. Expert Barista Training – While often overlooked, this is a vital part of ensuring our quality coffee beans shine the way they were meant to! Before you can decide if our beans are the right choice for your Gold Coast business, you need to sample our beans. 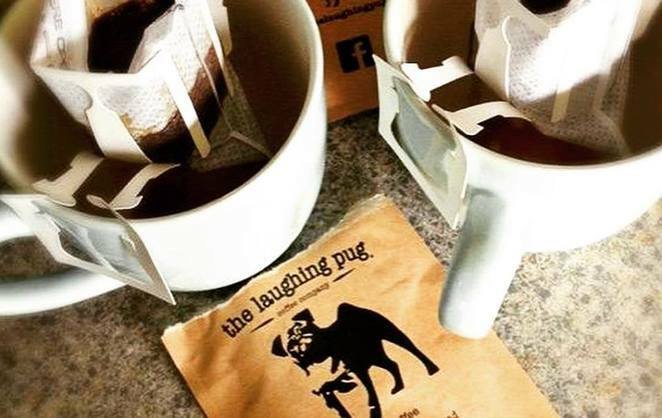 We will happily send you a sample of The Laughing Pug Coffee in exchange for your thoughts! Simply contact us or reach out via social media, and we’ll get a sample out to you immediately. Thank you for reading, and we hope you choose The Laughing Pug as your next wholesale coffee choice for your Gold Coast business. Please fill out the Wholesale Coffee Form for enquiries and orders. There’s a lot to love about life on the Goldie. Between the sea, the sand and the sun, we are pretty spoiled for choice living in one of the most beautiful areas of Australia. Another aspect we particularly love about the Gold Coast? All the local entrepreneurs! From our experience working at the local markets in Burleigh Heads (and elsewhere), to browsing the latest shop openings in the neighbourhood, we have been lucky enough to find several other entrepreneurs and small businesses we love recommending to our customers. In today’s market, we understand the importance of shopping locally, and hope you’ll consider supporting these excellent local companies on your next shopping excursion in the Gold Coast! While there are many recommendations we’re sure we’ve missed, our list of favourites are always expanding. Feel free to comment with your own personal GC shopping favourites in the comment section below, and let us know we should check out next! With one current location in Byron Bay, we’re stoked to say that Main Street is opening a second location in the Oasis Broadbeach Shopping Centre next month! Serving up a delicious mix of organic burgers with premium ingredients from local farmers, Main Street also offers salads, snacks, desserts, fresh coffee (from yours truly! ), shakes, specialty sodas, craft beer, wine and cocktails. We love their menu and ambience, and can’t wait to welcome them to the Goldie soon! After years in the Old Burleigh Theatre Arcade, Ultra Suite just celebrated the grand opening of their brand new, spacious salon in the heart of Palm Beach! Located just beside Wildernis Cafe, Ultra Suite is our all time go-to for hair colour and cuts. Owner Nicky and stylist Elise are extremely friendly and talented, and have saved us countless days, months and years of unfortunate hairdos. Grab a magazine, sit back, and let these ladies give you the Ultra Suite treatment in their gorgeous new salon. Created by husband and wife team, Alex & Ryan Hutchinson, Mahiya specialises in bohemian leather wallets, clutches, bags, footwear and clothing. We have always loved their colourful label, and the workmanship of their hand-tooled leather items is friggin’ outstanding. Luckily for Gold Coast shoppers, Mahiya has recently upgraded from an online store to a full Showroom in Currumbin, so go for a relaxing stroll along Currumbin Creek or arvo beer at Balter, and browse their goods in person! Offering a range of services that include Exercise Physiology, Physiotherapy and Xphys Training, StudioXphys is our local recommendation for dealing with physical pain. With a kind and talented team of pros, including Corey Rickit, Tegan McKenna and Ryan Lynd, we are thankful to have them on our team! Located just off the M1 in Mudgeeraba, they currently offer a free initial session with their Exercise Physiologist or Physiotherapist to see what you think. Have you ever noticed that each tattoo artist always seem to have their own suggestions for how to take care of your new tattoo? Yeah well, so did we, which is why we were stoked to finally discover Numb Skulled’s line of Natural Tattoo Aftercare products. These products are safe and made from quality ingredients, and we’re never turning back. Even better, they’ve also created a special Tattoo Scrub with The Laughing Pug Coffee, coconut sugar and pink salt! Located just a block off the Gold Coast Highway in Miami, Burleigh Social is one of our favourite places for brekkie or lunch. Serving up a tasty menu of acai bowls, eggs, sandwiches and burgers, we love this relaxed, indoor/outdoor space when we just can’t be bothered with cooking. Head here with friends the morning after a big night, and be sure to thank us later. Take a quick drive south to Tweed Heads to shop your heart out at SIX things, a pop culture shop that sells a bit of everything, from funky homewares to clothing, rare collectibles, and quirky items you didn’t even know you wanted. We love shopping here for gifts, and highly recommend popping by for a look at their unique items, or just to get a bit of creative inspiration. Thank you for reading, and please feel free to comment below with your favourite Gold Coast local businesses and shops. Don’t forget to browse our online store to get your Laughing Pug coffee products, and we hope to see you all on the Goldie soon!